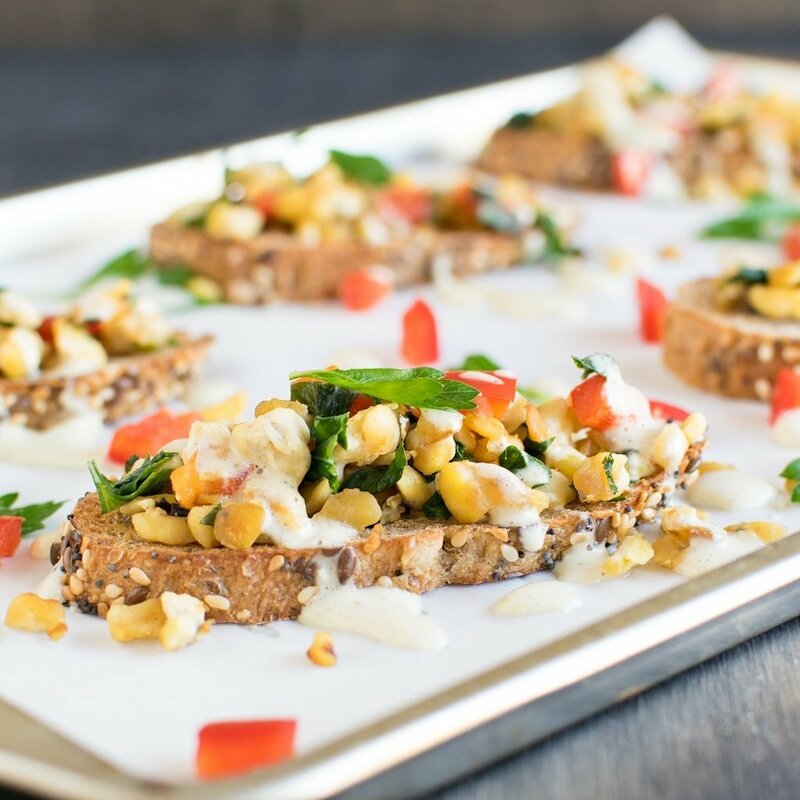 Herbed Cashew Cream Tempeh Crostini is not only healthy but is packed with flavor and outstanding taste. It’s very easy to make and is a perfect party appetizer. With Thanksgiving and Christmas approaching this appetizer is definitely a winner. 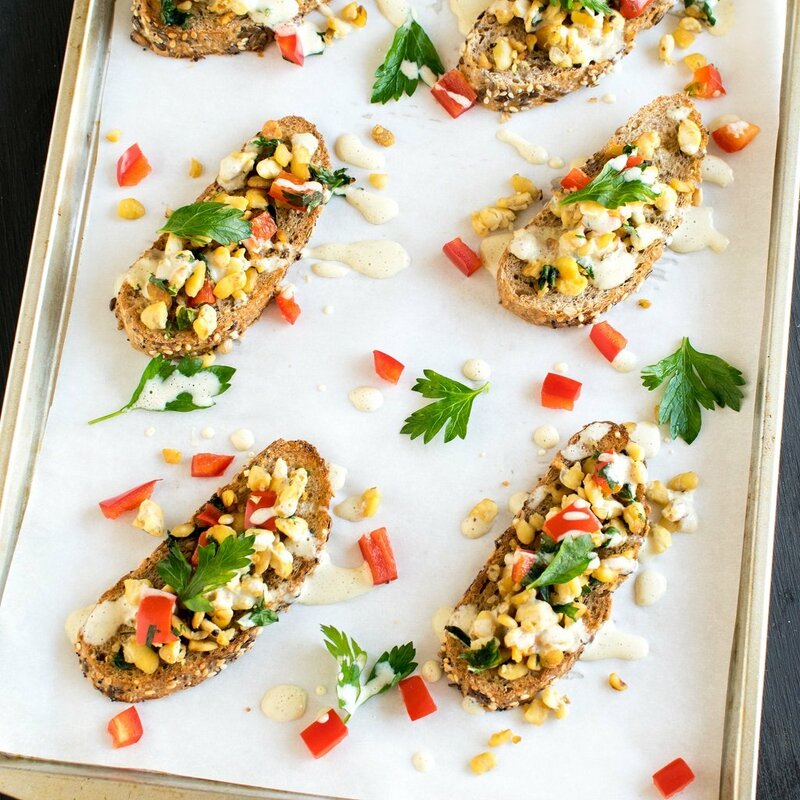 The delicious blend of herbs along with raw cashew nuts drizzled over tempeh crostini is to die for. I have been gorging over the leftovers for the entire week. Even my fussy eater family loved these crostini to the extent that they made me make them thrice over the last week. Hahahha!!!!!! I cannot get over the delicious flavor of the entire combination of the ingredients. Tempeh as we all know is super healthy and absolutely desirable protein. If tempeh is cooked properly it does wonders to any recipe. So I learnt a trick to cook tempeh this week. I boiled tempeh first before cooking them directly. I must say tempeh has never tasted soooo good before. Afterwards, I cooked them again thoroughly with Parsley and other ingredients. However, I made sure to brown tempeh slightly to bring that crunchy and chewy texture for this crostini appetizer recipe. So if you are inviting people over or planning a potluck, this Herbed Cashew Cream Tempeh Crostini will steal the limelight of the table spread. 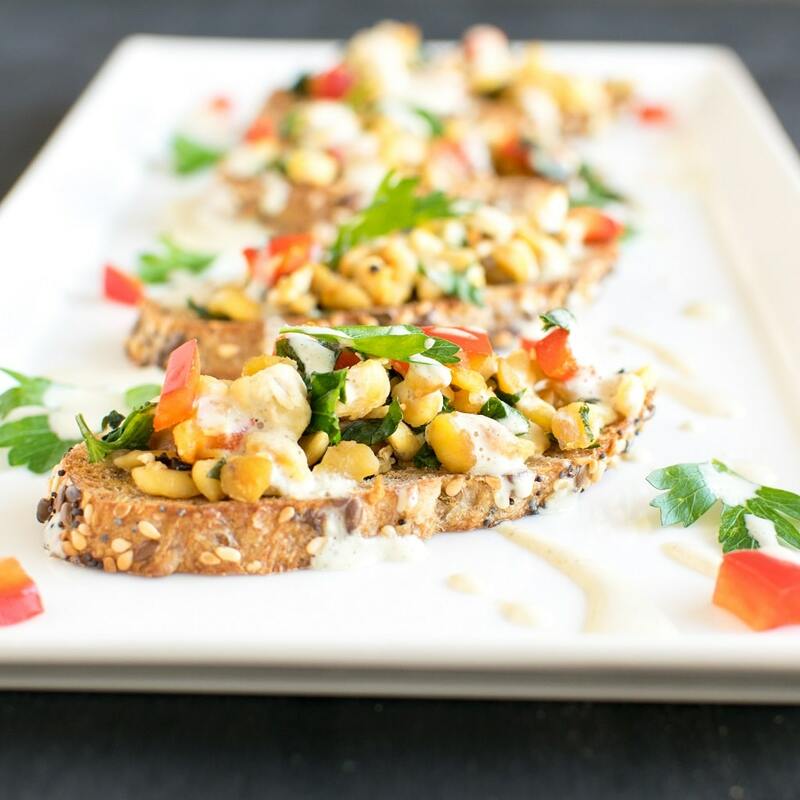 Herbed Cashew Cream Tempeh Crostini is not only healthy but is packed with flavor and outstanding taste. It’s very easy to make and is a perfect party appetizer. In a blender combine all the ingredients of cashew cream and blend it smooth. Keep it aside. Boil water in a saucepan and drop big pieces of tempeh. Let it cook for few minutes. Drain and crumble tempeh. Heat oil in a pan and add garlic. Let the garlic turn brown then add crumbled tempeh. Sautee and cook covered until tempeh turns golden brown. When tempeh is properly cooked add chopped parsley and red bell pepper. Cover and cook again 2-3 minutes. Turn off the flame and add salt. Mix and keep it aside. Place the bread slices on a cookie sheet and bake at 400 degree Fahrenheit until bread slices turns golden brown. You may also place the bread slices in a toaster oven and toast them until golden brown. (Before placing the bread slices if desired oil brush the bread slices for a beautiful brown crust of the bread). Take out the bread slices and top them with tempeh stuffing and drizzle cashew cream generously. Any bread of your choice can be used but this recipe tastes best with multigrain artisan bread. The cashew cream has a subtle tangy yet salty taste. It is versatile dip so the leftovers can be refrigerated in a glass jar and drizzled over any recipe or enjoyed as a dip as well. The stuffing and the cashew cream can be made ahead of time. Just before serving toast the bread slices and serve as per the instructions above. This recipe makes 12 crostini pieces and the serving size is 2 crostini per person. Mmmm this looks delish! Love a good crostini! the cashew cream sounds delicious, can’t wait to try it! I love cashews in anything! I’ll have to try this. This delicious crostini recipe looks superb! I love the colors, flavors and textures. This is the perfect appetizer recipe for the coming holiday season. Thanks so much for sharing it!